Education is the fundamental right of every child. 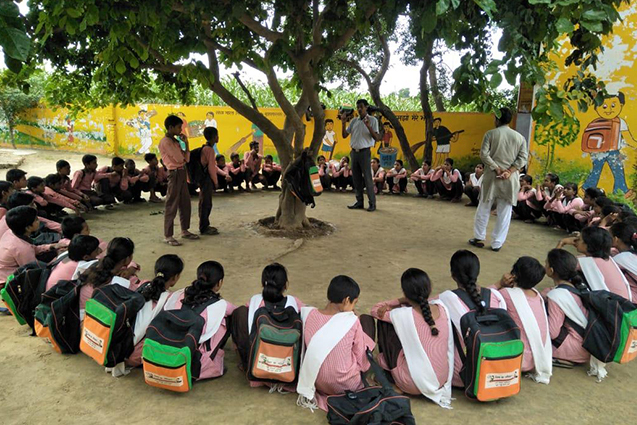 With the objective of identifying and mainstreaming out-of-school children, including the children affected by seasonal migration, ActionAid India and UNICEF launched a joint initiative, NaiPahal, in the last week of June, covering 20 districts of Uttar Pradesh that are lagging behind on indicators such as enrolment, attendance and transition of children. The specific aim of the project is to activate schools, communities and education governance systems to mainstream out-of-school children into schools. In addition, the intervention is also designed towards the reduction of child labour and child marriage, and for the promotion of children’s rights. Mapping through household surveys and identification of out-of-school children, including child labourers, children at risk of child marriage and children with disabilities, is being carried out under the NaiPahal project at village and ward levels, in close coordination with the Panchayati Raj Institutions (PRIs), School Management Committees (SMCs) and Community-Based Organizations (CBOs). In order to support the identification and regular monitoring of out-of-school children, special bodies – with representation from the local administration, civil society, relevant committees and other formations – are being formed at district as well as block-levels. These include the District Resource Groups (under the chairpersonship of the respective District Magistrates; formed in 11 out of the 20 districts so far), the Technical Support Groups (at district-level; formed in 11 out of the 20 districts so far) and the Block Supporting Groups (under the respective Block Education Officers/Block Development Officers; formed in all 209 blocks of the 20 districts). Besides, since NaiPahal is an intervention running in campaign mode, a minimum of 25 “influencers” have been identified in each of the 209 blocks of the intervention districts (around 5,000 of them in total); these “influencers” are regularly meeting the parents, teachers and members of SMCs in order to increase the attendance levels of children and identify those who are out-of-school. They are also facilitating the formation of household survey teams and ensuring that the surveys are conducted as per the Sarva Shiksha Abhiyan guidelines. Through the facilitation of these “influencers” and the support of Panchayats, SMC members, communities and others concerned, the NaiPahal project has so far been able to identify nearly 10,000 out-of-school children from the 20 intervention districts. In addition, through consistent advocacy with the State Elementary Education Department under NaiPahal, ActionAid India, along with UNICEF and other forums, has been able to successfully develop a clear definition for out-of-school children in the state, something that didn’t exist in clear terms till very recently. As per the same, the enrolled children who consistently remain out-of-school for 45 days without any prior information are to be considered out-of-school in the state. The State Elementary Education Department, thereafter, also released an order defining out-of-school children in the state in accordance with the above definition.